Berlin Classics is certainly keen on repackaging. To mark the centenary of Oistrakh’s birth, which fell in 2008, they released a Concerto twofer (see review) that contained the Bach and Vivaldi concertos and added a sequence of other pieces including, importantly, the Concerto by Ernst Hermann Meyer and also some decidedly non-concerto bits and pieces. 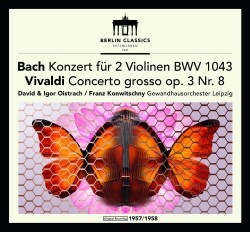 Here, now in a single disc, are the same Bach and Vivaldi concertos and this time, unannounced on the front cover, a bonus of the Franck Violin Sonata. This is a rare case of the bonus item almost exceeding in length the main show, welcome though it is. Oistrakh and Konwitschny (‘Con-Whisky’ to British orchestral players) forged a sympathetic relationship and made a number of mid-fifties recordings together in Leipzig and Dresden. David is joined by his son Igor. I tend to favour the more seraphic, the more rapt, partnership between Oistrakh and Menuhin in the Bach Double but there is certainly no doubting the immaculate and expected rapport between father and son nor the ensemble between them. The separation of the two voices is well judged; in fact, despite the muddiness of the lower strings the actual solo violin distribution in the sound stage is fine. The Vivaldi concerto derives from L’Estro Armonico and finds the two Oistrakhs in sturdy and masculine form. The highlight of the performance is the sense of noble desolation they manage to convey in the slow movement, though the opening is suitably invigorating and galvanising. Pianophiles may recall Isidore Philipp’s marvelous transcription of the work. I’ve never found the Franck sonata to be one of Oistrakh’s interpretative highlights, but then it’s a tricky work to get right. His lavish portamenti and control of dynamics allied to his tonal heft tend to convey an impression that he is slower and less malleable than might otherwise be the case. Anton Ginsburg is the fine accompanist but the violinist’s slightly earlier 1954 recording with Yampolsky, oft-reissued, is superior: both are preferable to the touted collaboration with Richter, live in Moscow in 1968. The booklet is fine, however. As well as reproductions of the recording sheets and a reprint of the original LP sleeve note there is a note which quotes the Eterna label boss Dieter-Gerhardt Worm. Eterna was the East German label on which the recordings appeared. Whilst Igor Oistrakh was moody and difficult in recording sessions his father, when recording Bach’s sonatas for violin and harpsichord in Dresden, would sneak out of the studio from time to time with a tape recorder where he could be found listening to Yehudi Menuhin’s recording of the same works. There’s nothing new to the discography here but the disc with its double butterfly cover presents its material in the best light.